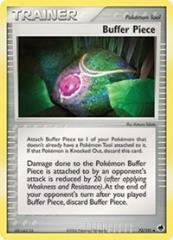 Description: Attach Buffer Piece to 1 of your Pokemon that doesn't already have a Pokemon Tool attached to it. If that Pokemon is Knocked Out, discard this card. Attack 1: Attach Buffer Piece to 1 of your Pokemon that doesn't already have a Pokemon Tool attached to it. If that Pokemon is Knocked Out, discard this card. Damage done to the Pokemon Buffer Piece is attached to by an opponent's attack is reduced by 20 (after applying Weakness and Resistance). At the end of your opponent's turn after you played Buffer Piece, discard Buffer Piece.